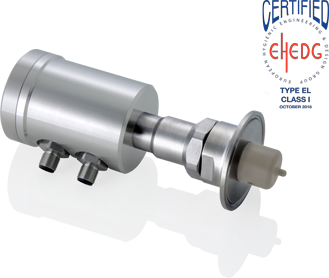 For many years, the ILM series has been providing high class and cost-effective conductivity sensors for hygienic applications in the food and beverage industry. The conductivity sensor ILM is used in applications for example the control of CIP-Processes (such as detergent / water phase separation), concentration measurement (such as the sharpening of CIP detergents), as well as reliable product monitoring and quality assurance.. The inductive conductivity meter ILM is primarily deployed for the control of CIP processes (e.g. phase separation of detergent/water), concentration measurement (e.g. increasing the concentration of CIP detergents) as well as it can be used for product monitoring and quality assurance. An integrated display for conductivity and temperature give the user direct control onsite, especially for manually controlled processes. In addition to the conductivity, the ILM outputs the medium temperature on the analog output, thus making an additional process parameter available without requiring a separate temperature measuring point. A compensation of the temperature error – that plays a major role along with the concentration of the medium–results from the temperature co-efficient (TC-value) of the liquid that can be set up in the electronics.